One of the major problems when you’re a novice with a camcorder is the apparent ‘need’ to play around with all the special effects and to incorporate them all into the home movie, overuse of the zoom lens is usually one of the main ‘culprits’. Basically, zoom should only ever be used if it actually enhances your video. 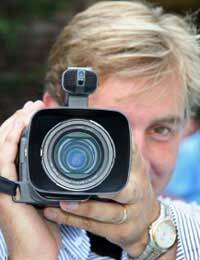 One of the basic rules of thumb is to bear in mind that viewers aren’t actually interested in what your camcorder can do – they just want to see what you saw. However, when used appropriately, the zoom can give your video a professional feel and here are some useful techniques. One of the most off-putting aspects of amateur film making is when the zoom is used far too quickly. A good zoom is one which is gentle and gradual which creates an experience that either slowly reveals more detail about a particular scene as you zoom out or captures the emotions on a person’s face as you zoom in. As well as the speed of your zoom, another common mistake when zooming is that the shot appears ‘shaky’. To rectify that, keep the camcorder as still as possible. Even better – use a tripod. In the majority of scenes that you shoot, there is nothing to be gained by using the digital zoom. Say, for example, you want to film activity on a mountain that is miles away. If you find that the view is still distant when you reach the capacity of your optical zoom, try to get a bit closer before shooting if possible. If it takes the digital zoom before the object you’re shooting comes into full view, you’ll often find that the result will be shaky and blurred anyway. One of the best ways to avoid this is to switch off your camera’s digital zoom so that you only have the optical zoom to rely on. Then, if it reaches its capacity and the image through your viewfinder still seems distant, either physically get closer or disregard the shot. Another good technique is to pick a spot in the centre of the object or scene you’re intending to zoom in on, then, as you slowly and smoothly zoom in (or out), keep that ‘spot’ in the centre of your viewfinder. The main thing to bear in mind when using the zoom is that you’d rarely see a professional TV programme or film where the cameraman would zoom in and out in the same scene. It would either be one or the other. To avoid doing this yourself, try to come up with creative ideas to take your shots from different angles and perspectives instead of relying on the zoom all the time. In other words, separate shots as opposed to one shot zooming in and out all of the time. An establishing shot where the viewers can get a sense of the location, a medium shot whereby the viewers can gain a sense of the action that’s taking place and a close-up shot which can illustrate more detailed reaction to the action, such as an emotion in response to a piece of dialogue. This method of shooting separate shots at different focal distances is far more professional than zooming in an out all of the time in one continuous shot.